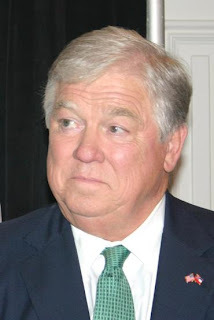 Interesting story in Politico today, exploring the power wielded by Mississippi Governor Haley Barbour. This is Politico’s second feature in two months on the man many people in the GOP regard as the de facto Chairman of the party. The fact that a left-leaning online publication has twice tried sounding the clarion bell on Barbour means that the chattering classes are worried about him. They should be worried. They should be absolutely petrified. No one controls more money or has more to spend in the 2010 mid-terms than Hailey Barbour, and no one seems to have the organization or network of power players that he does. Barbour, who runs the Republican Governors Association, has more money to spend on the 2010 elections — $40 million — than any other GOP leader around. And in private, numerous Republicans describe Barbour as the de facto chairman of the party. It’s not just because he controls the RGA kitty but, rather, because he has close relationships with everyone who matters in national GOP politics — operatives like Karl Rove, Ed Gillespie and other top Republicans running or raising cash for a network of outside political groups. Together, these groups are essential to Republican hopes of regaining power because Democrats are cleaning their clocks through more traditional fundraising efforts. The political class, in particular, is consumed with Barbour’s behind-the-scenes endeavors — this week, with the $1 million he got from Rupert Murdoch’s News Corp. Yet the reality is that Barbour has been uniquely adept at leveraging concerns about President Barack Obama into huge contributions from many others. Bob Perry, the Texas businessman who funded the Swift boat attacks in the 2004 campaigns, has given more than twice as much as News Corp.
Barbour’s stature has grown at the expense of cash-strapped, gaffe-prone Republican National Committee Chairman Michael Steele, and he has funded his various efforts by tapping into broad dissatisfaction with Steele — at one point, Barbour complained to donors that he needs to raise even more money because Steele is stumbling. This past quarter, Barbour’s RGA actually matched the Republican National Committee in fundraising, something that hasn’t been done in at least five years and probably much longer, according to a POLITICO analysis. The 2010 mid-term elections represent a juicy red meat opportunity for Republicans to take back the House of Representatives, and there is even serious talk about getting the 10 seats needed to take the Senate as well. With Barbour set to play a huge role in financing successful takeover campaigns, there will be a lot of very powerful Republicans who will likely be in his indebtedness. But there will also be a lot of new Republican office-holders in his debt, too. The chattering classes keep tossing about the same old names when it comes to speculation about who might seek the GOP nomination in 2012. Romney, Huckabee, Palin, Pawlenty, et cetera, et cetera, et cetera. None of those people have the clout Barbour does. As I said back then, if he decides to run, he’s going to be hard to beat. He out-raises, out-organizes and out-works his opponents, and if the 2010 mid-terms go his way, he’ll have the entire party apparatus eating out of his hand.